The health benefits of probiotics are undeniable. Providing your child with these supplements may go a long way in preventing or stopping any diarrhea or digestion issues they may be experiencing. It can even be a great boost to their immune system. This is particularly important when your child is potty training or starting school because keeping their body more regulated will prevent accidents that may hinder their other development. As always, talk to your doctor before you start your child on any supplement, particularly if they have any immune disorders. We reviewed dozens of probiotics for kids to identify the best of the best. We looked for powders and liquids that you can slip into your child’s food without them knowing, gummy vitamins that your child will love to eat and easy-to-take pills. We found chewables that will go down easily and liquids your toddler can take in a medicine dropper for their ease of use. No matter what method your child prefers, we found a way to make sure your children get those probiotics into their system without complaint. 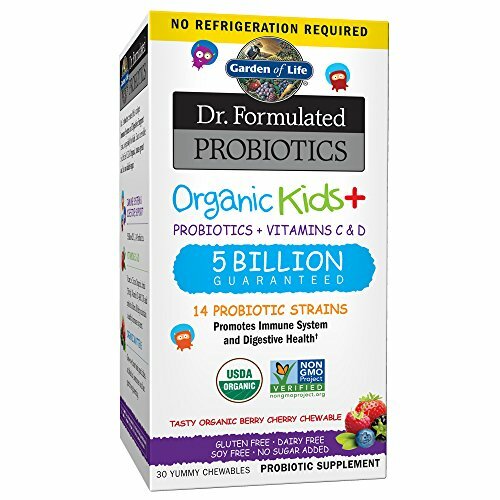 For a probiotic that will give your child all he needs and then some, look no further than the Garden of Life Probiotic for Kids – Dr. Formulated Organic Kids. Early in our research, we determined the Garden of Life Probiotic for Kids – Dr. Formulated Organic Kids was the clear winner for our Top Pick choice. The chewable is an easy-sell to your kid because of it’s pleasant taste but even if that doesn’t appeal, you can always grind it and sneak it into some food or cut it half to let them swallow like a normal pill. The Garden of Life Probiotic for Kids – Dr. Formulated Organic Kids is a great option for your little one with tummy issues; and all with no refrigeration requirement, either. With 14 separate probiotic strains, this is sure to address anything that a probiotic can address. It has five billion CFUs, so there’s plenty to keep your child’s digestion on track. This supplement also has additional vitamins included, so should you be concerned about your child’s vitamin intake, it includes a dose of each Vitamin C and D; 33% and 50% of your child’s daily recommended intake, in fact. And considering that extra Vitamin C may help keep your child from catching a cold, we doubly love it. With over 500 customer reviews on Amazon, this supplement has earned an overall rating of 4.2 stars; and that’s nothing at which to scoff! You can take comfort in the statistical odds that you would be one of the overwhelming majority of this product’s satisfied customers. 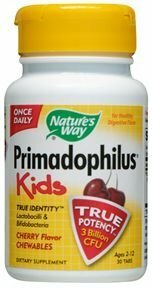 The Nature’s Way Primadophilus for Kids is a chewable vitamin that has a potency guarantee to make sure your’e getting an impressive number of probiotics. The Nature’s Way Primadophilus for Kids is a cherry-flavored chewable that you won’t need to fight your little one to take. Both the consistency and flavor are raved about through the reviews and any kind of supplement that will allow your little one to keep a healthy, optimal functioning immune system is going to be a home run for you. Most probiotics include a fine print with their impressive counts of probiotic “colony forming units” that state that this number is at the time of manufacture, but that may or not be the number you’re actually getting by the time the probiotic comes to you. This one, though, comes with a true potency guarantee to assure you that its 3 billion CFUs are for the entirety of its shelf life. This supplement has over 200 customer reviews, earning it an overall rating of 4.4 stars on Amazon. And that means you can be confident in your satisfaction. 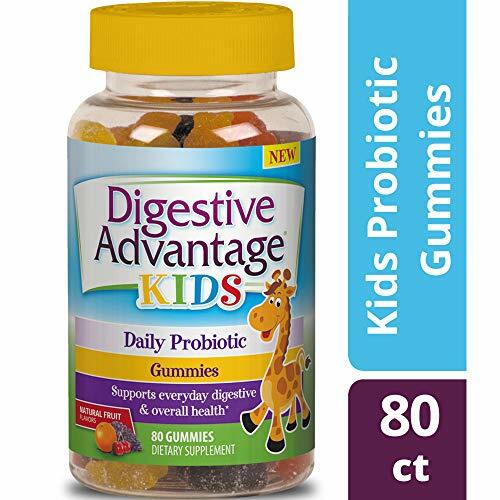 For a probiotic that won’t set you back on your budget, try Digestive Advantage Kids Daily Probiotic Gummies. The key difference that sets the Digestive Advantage Kids Daily Probiotic Gummies apart from its competitors is that it contains a patented formula, BC 30, which is designed to survive stomach bacteria 100x better than the other leading probiotics on the market. This ensures that your child gets the maximum benefit of the probiotic, and the assorted gummy flavors will make them think they’re eating candy. The natural fruit flavors of these gummies will have your child looking forward to taking his vitamins, possibly even thinking of it as a treat time. They’re made without artificial dyes, too – the colors are made with fruits and vegetables so you can feel safe giving them to your little ones. The Digestive Advantage Kids Probiotic has an overall rating of 4.2 stars on Amazon and nearly 300 customer reviews. And while that’s enough to tempt us, in case you need more convincing, you can also pick up 80 gummies for under $15 and you can subscribe and save to take one more thing off your to do list. Rainbow Light – Probiolicious Probiotic is a yummy gummy that’s so tasty, your little ones will love to eat it. 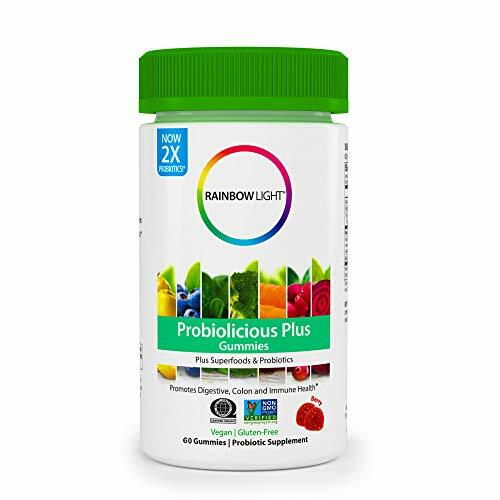 Rainbow Light – Probiolicious Probiotic Gummies isn’t specially designed for children, but it can be taken by anyone from age 4 and up, so this one bottle can take care of your whole family by just altering the dosage. And with a yummy cranberry flavor, the whole family is sure to enjoy them. Your children from 4 to 12 years old will take just one daily and anyone over 13 will take two daily. If your little one has any food allergies, this may be the supplement you’ll want to start on because it contains no shellfish, eggs, milk, soy, peanuts, fish, wheat, or gluten. And there’s only 1g of sugar for 2 of these gummies, so you won’t need to worry about it sugar-ing him up, either. Nearly 600 customers have voiced their opinion of this probiotic on its Amazon reviews, giving it an overall rating of 4.2 stars. The manufacturer will now even ship with an ice pack if shipping in warm months to ensure the product doesn’t melt together. For a chewable vitamin your child won’t mind taking, try the Culturelle Kids Chewables Daily Probiotic Formula, One Per Day Dietary Supplement. 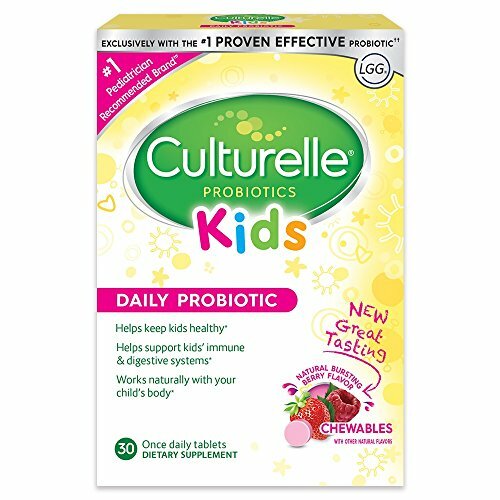 The Culturelle Kids Chewables Daily Probiotic Formula, One Per Day Dietary Supplement contains the most researched strain of probiotic bacteria, meaning that taking this supplement will give your kid the probiotic that we know the most about, minimizing the risk. And the berry flavor is so appealing that your child will likely look forward to his “medicine” time. This dairy, sugar, and gluten-free chewable supplement has a shelf-life guarantee stating that as long as the product hasn’t exceeded its expiration date, its potency will remain the same as the day you bought it. And from the brand you are probably most likely to recognize, that definitely holds some weight. There are over 450 customer reviews on this probiotic on Amazon with an overall rating of 4.4 stars, making it a safe bet for your satisfaction. 85% of the reviews are positive and the chances are, you’ll be yet another satisfied customer. Giving a probiotic supplement to your child can help him maintain a healthy digestive life. It will keep him from smaller cases of diarrhea and nausea, as well as help his bigger illnesses as well. It boosts your kid’s immune system and can even help prevent sicknesses. Since 70% of a body’s immune system is located in the stomach, it makes perfect sense that keeping a solid store of “good” bacteria will help your little one prevent illness and bounce back even faster. It may also have a positive impact in your child’s weight and skin irritations, as well. So a probiotic can help a healthy kid live an even healthier life. As with any supplement you will need to check with your family doctor before starting a new regiment or diet to see if there are any complications you may not be thinking of and to see if your doctor thinks a probiotic can help your child. If he has an autoimmune disease, like juvenile rheumatoid arthritis or irritable bowel syndrome, there’s a chance these conditions will be eased with the introduction of a good probiotic. Conversely, if he has a severely compromised immune system, with cancer or was born prematurely, a probiotic may be too much of a change for his system to handle. That’s another reason it is vital that you speak with your pediatrician before giving probiotics to your child. If you’re looking for probiotic supplements for yourself or your partner, we’ve also reviewed the best probiotic supplements (for adults) in a separate post. Multivitamin. You can’t give your kids a handful of pills every day, even if they would benefit him. Making sure your little one gets enough of his vitamins and minerals will go just a bit easier if you can give one or two pills and be done with all the vitamins and minerals he needs and also give him the probiotics he needs, too. CFUs. The phrase “colony forming units” is often abbreviated to its initials on the container of a probiotic. It refers to how many bacteria in the supplement are capable of dividing and forming their own colonies. When it comes to these numbers, they will probably seem incredibly high to you. Some go up to 50 billion CFUs, but keeping in mind that your body contains roughly 100 trillion bacteria at any given time (that’s approximately 5 pounds of your body weight in just bacteria), it really isn’t that much. If you’re looking for a good daily supplement to maintain a healthy immune system, you’ll want a range between 5-10 billion CFUs. If you’re taking them for a specific condition or illness (like an inflammatory disease or allergies, for example), you will likely want somewhere in the 15 to 45 billion range. Gummy. You may have the best luck with your child actually taking these types of supplements. After all, they’re just like little gummy bears or fruit snacks. In fact, you may have a harder time convincing them to eat just one dose than that they need to eat them at all. Unfortunately, the down side of these probiotics is also that they’re just like gummy bears. They typically have a pretty high sugar content and they can cause cavities just as easily as any other gummy. Chewable. A chewable vitamin can be a tasty option that doesn’t have quite the sugar content of a gummy. So you may have a better success rate for getting your little one to take their vitamins without the extra sugar and cavity risk. Be ware though, it will still need brushed out before bed – even foods with a lower sugar content will still need to get out of the teeth in order to prevent tooth decay. Melts. If your little one struggles with other forms of probiotics, particularly if they have orthodontic apparatuses or are prone to cavities, you may want to look into a melt that will dissolve on his tongue, keeping the pill from choking him or gummies or chews out of their teeth. However, you’re at the mercy of the melt’s taste so be sure to choose one your child will like to avoid wasting money on a probiotic that won’t be taken. Liquids. If it’s just a matter of principal that is keeping your child from taking his probiotic, you’re not without options. You can find a liquid that you can sneak into his food or drink and he’ll be none the wiser. If it’s flavored and he notices a difference, you could even sell it as a special treat for when he’s good. As most parents know, it’s all in well you can spin it. Otherwise, look for a flavorless one that they’ll never notice. Easy-to-swallow pearls. If your child is close to being able to take a pill but just not quite there, then an easy-to-swallow option may suit her best. Not only will it keep everything out of your little one’s teeth, there won’t be the added sugar and she may even be excited to take a pill like a grown-up. What is a child’s probiotic and how does it work? To put it in the most simple terms: A probiotic is good bacteria. Your body needs good bacteria to counter the bad and to keep things running smoothly in digestion. They are naturally occurring in some foods, most notably yogurt and cottage cheese. For children, it comes in smaller doses and typically uses different strains of bacteria. For infants and young children it uses Bifidobacterium more often, as they’re the best strain to break down lactic acid in milks while older children and adult probiotics will use more Bifidobacterium bifidum and Lactobacillus GG, which are a more wide reaching bacteria. Generally, though, all probiotics act the same for a child as they would for an adult by creating a more healthy gut which can lead to more consistent digestion, clearer skin, stronger immune system, and healthy weight. How can probiotics help my child? Most people take probiotics to regulate their digestive system. For children, it can help prevent constipation or diarrhea so if you have issues with either, a probiotic may be of interest. It can also regulate the immune system, as long as that immune system isn’t dramatically compromised, with cancer or is a premature infant, for example. Barring those instances, though, they may strengthen your little one’s immune system, preventing them from getting sick or minimizing the duration of any illness they do develop. Some studies say that a probiotic may even help prevent respiratory problems and sicknesses. (It’s not a cure-all but could definitely help.) It can also help prevent and clear acne, so your older children may appreciate that side effect, too. It could even help anxiety, some studies claim. With probiotics, you may be able to help prevent, or lessen the effects of autoimmune diseases (Like irritable bowel syndrome, for example) and allergies or asthma. Some critics say that because a child’s body isn’t fully developed, it may pass probiotics as waste, but they shouldn’t harm your healthy child as long as given as directed, even if this were the case. Can my 2-year old take probiotics? There are probiotics that can be taken by infants, so yes, you can give a probiotic to your 2 year old. In fact, some studies have shown that giving them young may prevent some diseases or illnesses. Infants in a day care were less likely to contract a rotavirus and by the time they were two years old, after being given a probiotic consistently from 4 months on, were less likely to develop eczema or asthma. However, you may not be able to easily find an over-the-counter probiotic for a child that young. You’ll always need to check the recommended age and dosage before giving any medication or supplement but it it also doubly important to check with a pediatrician before introducing your toddler to anything new. Can I give probiotics with antibiotics? Not only can you give your child probiotics when she is on antibiotics, that may just be the best time to give her probiotics. To put it in easy to understand terms, antibiotics will kill all bacteria in your stomach, both good and bad. But some bacteria in your stomach is necessary. One of the most common side effects of the absence of this good bacteria that a child experiences while taking antibiotics is diarrhea. Probiotics will give your body the good bacteria it needs to prevent the miserable side effects of antibiotics. This yummy gummy supplement is sure to please your picky child. It is sugar-coated, so be sure to note that in weighing your options. You may not want to give this to a child who has diabetes, but if your child is extra picky, the extra little boost of sweetness may be what puts this in your child’s favor. And as we know of picky kids, sometimes just getting things in their system is a total win! This gummy is a great combination of multivitamin and probiotic supplement, which is great for simplicity’s sake. And because it’s a multivitamin, you will be able to incorporate probiotics into your child’s system a bit earlier than you might have otherwise; 1 gummy for your child aged 2-3 and 2 for your kids 4 and up. These strawberry and orange gummy vitamins boast they have the highest strength of any gummy probiotic, 5 billion CFUs for your children 4 and up (2.5 billion for the 3 year old serving). And the strain it utilizes, Bacillus Coagulans, is one of the more effective and studied strains so your child will be getting the best available. These yummy gummies have a 99% survivability rate, which means that they’ll keep their shelf life and survive your stomach acids. With 4 billion CFUs and 2 probiotic strains, this gummy will give your child’s digestion and immune system the boost it needs. This chewable tablet comes in a cherry smoothie flavor your child is sure to love. The supplement boasts that taking it once daily will provide your child with 24 hour digestive support, 7 days a week – and they put their money where their mouth is, because they also offer a 100% money-back guarantee. This chewable probiotic may be more to your child’s liking with its mild vanilla flavor, and with just one vitamin a day, it could be the quick and painless solution to your baby’s tummy problems. There is no age restriction listed, and it even suggests a method of giving it to an infant, but as always, be sure to talk to your doctor before starting your child on a new supplement. This probiotic is a good option for a quickly accomplished dosing. If your child has trouble swallow pills, this chewable tablet is a great alternative. And these probiotics come with prebiotics. The probiotic has 6 billion CFUs, this is sure to accomplish whatever a probiotic can. This chewable supplement goes the extra mile to ensure the potency of it’s 8 probiotic strains. Each tablet is uniquely packaged and flushed in dry nitrogen blister packs to keep the 5 billion CFUs alive. It’s 8 different strains will help a child’s sensitive stomach recover from the aftereffects of antibiotics and help to ensure a healthy digestive system. And with its natural tangerine flavor, your kid will love to take these! This chewable vitamin is your child’s month supply of probiotic supplement to ease their digestion. The taste may be dependent on your child’s preference, but the effectiveness won’t be – the flora contained within these tablets will support your child’s overall health by bolstering her immune system. This is a great option if you just want to sneak the probiotics into your child’s diet without having the conversation. So, this is particularly helpful for picky kids. You can mix it into water or juice, because the fruit flavoring will convince your child he’s just drinking fruit juice. These tasteless sprinkles are another clever way to sneak an extra boost to your child’s immune system into their bodies. You just pour this pack over a solid/liquid mix, such as baby food, applesauce, or cereal, mix until it’s dissolved, and your little one will be none the wiser. This probiotic can be started very early in your child’s life, at 3 months of age to be precise. You will need to start at 1/4 teaspoon and work up to the 3/4 teaspoon dosage, and you will need to talk to your pediatrician for specifics on how to do so, but being able to use this so early on makes it stand out among its competitors. Should you want to add the probiotic to your child’s diet without the pain of having to fight them about it, this may be right up your alley. The banana taste may not work in all food combinations but mixing with an applesauce or into your child’s fruit juice can make for a yummy treat. This is a good option if your child is to the point where they can start trying to take pills. This is an easily taken medicine that could be a good start to teach a child to take pills and because it is a small sphere (under a quarter inch), they even call it a “pearl” rather than pill. This alternative to the standard method of probiotics can be treated as just an afternoon or morning treat. They’re packaged individually in plastic and foil and the texture will easily convince your child that they’re eating candy. If you don’t necessarily struggle with getting your child to take his supplements as much as you do getting his to brush his teeth, you’ll want to take a closer look at this probiotic. Even though it is a chewable with a great sweetened flavor that will appeal to your child, it’s sweetened with Xylitol, which won’t hurt your child’s teeth. And even that great benefit aside, you’ll still be providing your child with 4 probiotic strains and 2.5 billion CFUs! This probiotic supplement doesn’t claim it has more CFUs than its competitors; it makes the claim that its probiotic strains are fortified to withstand your stomach acids and ensure you’re getting the most from its 3 billion CFUs. So even if it doesn’t have the most, it may still be better-digested and absorbed than some. This is a great option for your younger child who needs some help with their tiny tummy (hence the name). This can sure your child’s digestion is all in order before adding to your troubles by potty training, and the age limitation won’t present a problem no matter what age you start. This probiotic also gives an extra boost of Vitamin D for added bone support. The probiotic contained in this supplement is the trademarked super strain, lactobacillus acidophilus, which has been studied for over 35 years, making it a well documented source of digestive support. This probiotic comes in liquid form, and its fruit punch flavor makes it more likely to get past your child’s picky defenses. You can mix it with your child’s drink or food but it’s reviewed so tasty that your child will likely just take it like any Tylenol dosage. And those reviews also sing the praises of its effectiveness, preventing constipation and clearing up yeast infections caused by antibiotics.